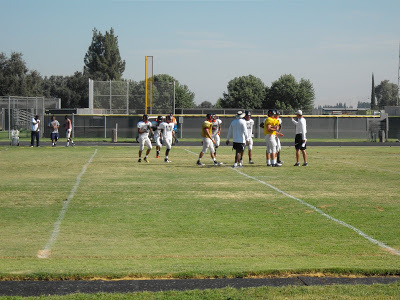 The Reedley College Tigers open the football season on September 6 with a 7 p.m. home game against Mendocino College. I asked head coach Randy Whited a few questions about the 2014 season. Larry: Can you give us an idea of what we will see on the field this season? Larry: You have a new Offensive Coordinator this season. What does Ernie Rodriguez bring to the O/C position, and what will we see different in the offensive scheme? Coach Whited:Coach Rodriguez has a solid grasp of the nuances of the Spread Offense and has done an excellent job to date with its installation. You will see an offense that will run the ball more effectively (especially the QB) and a much more sophisticated passing game. Larry: It’s been a couple of difficult seasons lately. Have you lost any of your enthusiasm for coaching? Coach Whited:Not at all; I am a football coach. We take the good with the bad but never accept losing. Larry: Are there players who you are counting on this season to make an impact? Coach Whited:We expect every player that makes our roster to be a guy that we can count on to be a great teammate. A guy that will put team before self and compete. Larry: How big of a challenge is it to have a virtually new team every two seasons? Coach Whited:That’s JC football. You basically rebuild your team each year both physically and mentally. Larry: Do you set goals for wins in a season? Coach Whited:All that I am focused on is that this program, this team, and each player get better each day. My only goal for this program is to be 1-0 after game one. I invite you and the surrounding community to come and see us on Saturday, September 6 in our home opener vs. Mendocino College @ 7 p.m.
Coach Whited is obviously not a man of many words, but he is a committed and talented coach, and this year’s Tiger squad deserves the support of the community. See you at Reedley High on September 6 at 7 p.m.! Watch for Reedley College Football game recaps to be back on Monday nights here at KRL and hopefully some more interview throughout the season!